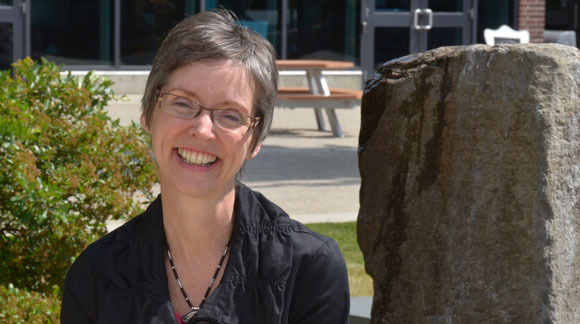 Carolyn Labun has been appointed the first director of the Centre for Scholarly Communication, a new two-year pilot program at UBC's Okanagan campus. The Centre will support graduate students as they develop advanced writing skills and share their research findings in the digital world. "The goal of the Centre is to help graduate students develop the skills to communicate their message and knowledge, not only to other scholars, but also to members of the wider community who will benefit from their work," says Labun. Labun joined UBC's School of Engineering in 2005 to teach academic and technical communication to undergraduate students in Applied Science. Since then, she has also worked with graduate students, providing one-on-one writing consultations, delivering a variety of communication workshops, and contributing to the development of a course in graduate communication. Labun is also the editor of an open source journal, First Words: Journal of Undergraduate Engineering Writing, which publishes the academic and creative writing of first-year engineering students. She is a recipient of the 2011 UBC Award for Teaching Excellence and Innovation and the 2010 Faculty of Applied Science Engineering Co-op Program's Faculty Member of the Year Award. The Centre for Scholarly Communication initiative is the result of the vision and dedication of a group of faculty members who recognized the need to establish a centre to support graduate students as they communicated the results of their scholarship. It is being underwritten by pilot funding from the Office of the Provost. From 2005 when the College of Graduate Studies began with 41 students, there are now more than 500 graduate students on the Okanagan campus. "As the Centre grows, we look forward to expanding our offerings to support the scholarship of junior faculty members and to being a place where faculty, graduate students and upper-level undergraduate students from all disciplines can work together to achieve their goal of spreading the story of their research," Labun says.